It's my 15th wedding anniversary today. It's only just occured to me that I could have looked at the gifts associated with it for inspiration for DH's card. It seems to be crystal (not easy for a masculine card) or, if you're modern and American, watches! I guess I could have done something with that but the thought came after the card was made - never mind! I went clean and simple with these lovely detailed shell images. I stamped them on kraft card so they have a different look than if they'd been stamped on white. Even when you colour with an opaque medium like pencils the base colour does make a difference, I find. A bit of torn kraftcore provides a splash of colour and I've sanded the torn edges for a more natural feel - reminiscent of weather-worn paint on beach houses, perhaps. 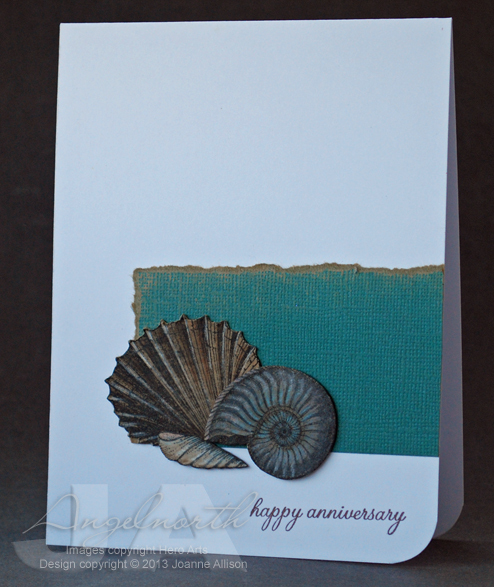 I used scraps of cardstock to raise a couple of the shells just very slightly from the card as I stuck them down. A simple stamped sentiment and one rounded corner finish it off. Happy Anniversary to you and Mr. Angelnorth - super card. Happy Anniversary to you both. I love the card. It's a fabulous card (love the stamping on kraft). Happy Anniversary! A belated Happy Anniversary to you both. This is a beautiful CAS card. I like the idea of stamping the shells on kraft card it definitely gives them a more weather-worn look. This is so lovely yet so masculine. Thanks for the tip to use kraft more often.